Roy Carroll believes it is only a matter of time before Linfield start clicking into gear this season. The Blues have won just one of their first three Danske Bank Premiership fixtures – an opening day victory against Ballinamallard United. David Healy’s side scrambled a contentious draw against Coleraine before Saturday’s spirited stalemate against champions Crusaders. They were forced to graft for their point at Seaview following Stephen Lowry’s dismissal for two bookable offences shortly after half-time. “It takes time for new players to gel together and start playing as a unit. We are still getting to know each other,” said Carroll – who joined the Blues in the summer. “We are only three games into the season, winning once and drawing two. So we can’t be too disappointed. We are unbeaten which is important. 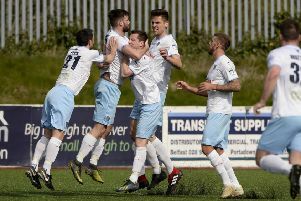 Blues boss Healy called for his players to prove their title mettle at Seaview, following a lacklustre display against Coleraine three days previous. “It was a good performance, and we showed great character today,” Northern Ireland goalkeeper Carroll said of Saturday’s display. “The boys grafted and stuck in there after going down to 10 men. Lowry was booked in first half stoppage time for tugging back Paul Heatley. His second yellow card came in the 51st minute following a foul on Declan Caddell. In a game of few chances, Crusaders winger Gavin Whyte and substitute David Cushley tested Carroll in the second half, while Linfield defender Mark Haughey squandered a great heading opportunity in the 54th minute when he somehow missed the target from four yards out. “We had a few chances from free-kicks and corners, and we could have sneaked the win on another day,” Carroll added. “I didn’t really have that much to do. It was the same against Coleraine. “That is going to happen at Linfield, but I just have to keep concentrating so I am ready when I am called into action. “But the boys in front of me deserve credit, and it was a team effort to keep a clean sheet. “These players work hard all day and then come in to train or play games. Crusaders manager Stephen Baxter admitted a draw was a “fair result” at Seaview. “Neither team got the ball down and passed it well in good areas,” Baxter said. “Both defences were on top, so it was a cagey affair, something you expect at this early part of the season. Linfield chief Healy added: “I think the least we deserved was a point, especially after going down to 10 men. “I thought we defended well and created a couple of chances. “It was an improvement on Wednesday’s game against Coleraine and it is something to build on. I wanted a response and I got it today.